The double-fold binding method uses a single layer of fabric on the edges of the quilt, making it more economical than traditional bias binding. This type of bias binding isn’t quite as durable as traditional binding, so use it for projects that won’t be handled or washed frequently, such as wall hangings and table runners. Double-fold binding is great for anything that has rounded corners because the natural stretch of the bias along with the single layer at the edge helps you round corners smoothly. Pressed for time? If so, pick up double-fold bias tape in any fabric store. It comes in a variety of colors and even some prints, such as gingham. Look for packages marked “Extra-Wide Double-Fold Bias Tape.” Because this premade binding is sold in packages containing 2 to 3 yards of bias tape, you’re likely to need several packages. Cut strips of fabric four times wider than the desired width of the finished binding. For example, if you want a finished binding that’s 1/2 inch wide, cut strips that are 2 inches wide (1/2 inch x 4 = 2). Fold the strip in half lengthwise with the wrong sides together (see a in the following figure). Open the strip so that the wrong side of the fabric faces up. Fold each side of the strip toward the center fold so that the raw edges meet in the middle (see b in the following figure). With the sides still folded in, refold the strip along the center crease, and press it to reestablish the center crease. Open all the folds of the binding strip, and turn in 1/4 inch at the starting end of the strip so that the right side of the folded piece faces you. 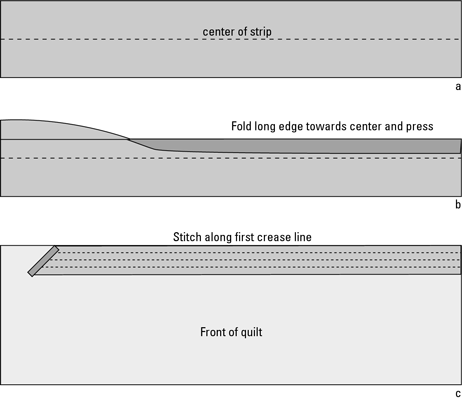 Place one raw edge of the binding strips along the raw edge of the quilt top (right sides facing), and machine stitch in the ditch of the binding crease nearest the edge (see c in the following figure), about 4 inches from the end of the length of binding, leaving a tail. When you begin to approach a corner, slow down a bit so that you have better control, and stitch to within 1/4 inch of the corner of the quilt top. Backstitch once or twice before cutting the thread and turning the quilt. Miter the corner by folding the bias strip upwards at the corner so that it extends the right-hand edge of the quilt, and then fold it down so that the newly made fold is even with the top edge of the quilt, the one you just stitched along. Holding the folded binding in place, line up the quilt in your sewing machine so that you can start stitching the strip to the next side of the quilt, around the corner. Continue stitching the binding to the edges as described in Step 9 and mitering the corners as described in Step 10. To end your binding back where you started (what goes around comes around), trim the ending tail of the binding so that it overlaps the beginning by about 2 inches. (You left 4 inches of it unstitched, remember? If not, see Step 9.) Insert the ending tail of the binding into the folded beginning, and continue stitching through all the layers. Trim away any excess backing fabric and batting (anything that extends beyond the quilt top) with scissors. Fold the binding to the back side of the quilt. The center crease should lie along the very edge of the quilt. On the back side, use the blind-stitch to hand stitch the binding in place along the remaining crease, stitching directly over the machine stitching line. Folding (a, b) and stitching (c) a double-fold binding.